The new year rapidly approaches, and for many of us, let’s face it, this is a time to relax and recharge our batteries before the madness of New Year celebrations arrive. A time to curl up with a good book, hopefully with a nice warm fire (or radiator) nearby or a duvet pulled up tight. For one, or rather three, couples in 1812 however, this was a time of great activity, and one that would change their lives forever. 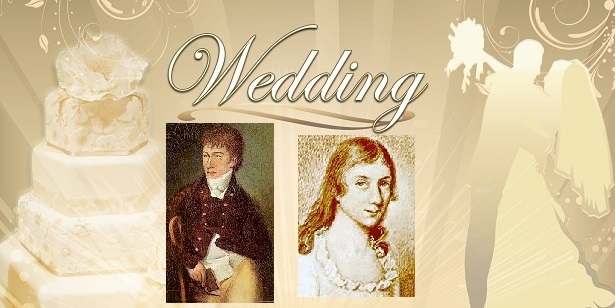 It also changed literary history forever, for on this weekend 206 years ago, Patrick Brontë married Maria Branwell. 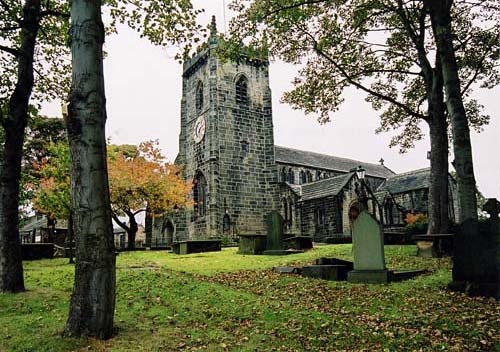 On 29th December 1812 the farmer’s son from County Down and the merchant’s daughter from Cornwall were married in St. Oswald’s church in Guiseley, between Leeds and Bradford. 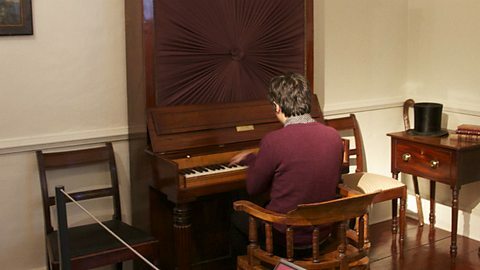 It had been a whirlwind romance, as Patrick and Maria had only met that summer when Patrick took up a post as classics examiner at Woodhouse Grove school in Leeds. It was a Methodist school run by John and Jane Fennell, who had earlier met Patrick when they were all living in Shropshire. Their niece had arrived at the school, after a journey of over 400 miles, around the same time to work in an administrative position, although she may later have expected to take up a teaching role – this was, of course, Maria Branwell, as Jane was the sister of her father Thomas. Woodhouse Grove had seen a series of strange coincidences that summer, as Reverend William Morgan had also met the Fennells and Patrick Brontë during an earlier ministry in Shropshire before he too moved north to the burgeoning towns of the West Riding of Yorkshire. Originally from Wales, Morgan fell in love with the other young woman at the school, Jane Fennell junior – cousin to Maria Branwell. 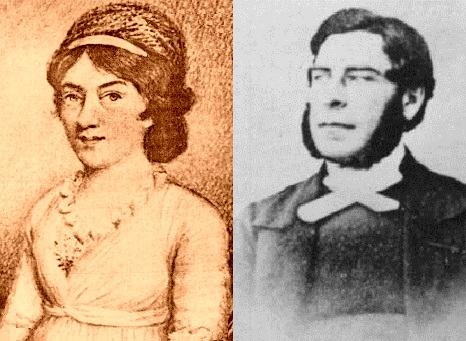 Patrick and William were lifelong best friends, and Reverend Morgan presided over many important events in the lives of the Brontë sisters – from their christenings to, all too soon, their funerals. 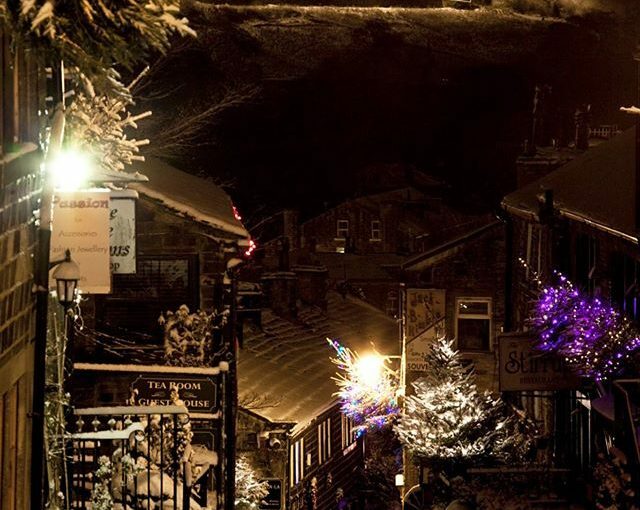 But wait – I mentioned three couples, so let’s turn to the third couple, as that leads us to a detailed account of what happened on that December day in Guiseley. 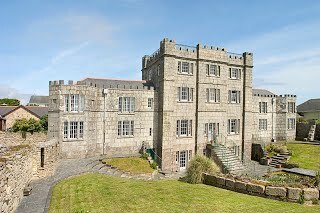 ‘It was arranged that the two marriages [Patrick and Maria and William and Jane] should be solemnized on the same day as that of Miss Charlotte Branwell’s mother, fixed for 29th December in far off Penzance. And so, whilst the youngest sister of Mrs. Brontë was being married to her cousin, the late Mr Joseph Branwell, the double marriage, as already noted was taking place in Yorkshire. Miss Charlotte Branwell also adds that at Guiseley not only did the Rev. Mr Brontë and the Rev. Mr Morgan perform the marriage ceremony for one another, but the brides acted as bridesmaids for each other. 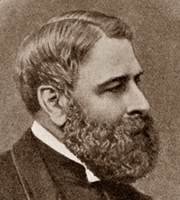 Mr Fennell, who was a clergyman of the Church of England, would have united the young people, but he had to give both brides away. Miss Branwell notes these facts to prove that the arrangement for the three marriages on the same day was no caprice or eccentricity on the part of Mr Brontë, but was made entirely by the brides. She has many a time heard her mother speak of the circumstances. “It is but seldom,” continues Miss Branwell, “that two sisters and four cousins are united in holy matrimony on the same day. Those who were united on that day bore that relationship to each other. 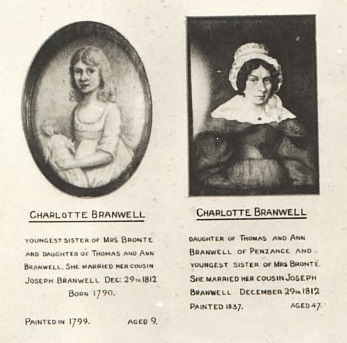 Mrs. Brontë (formerly Maria Branwell) and my mother, Charlotte Branwell, were sisters; my father was their cousin; and Jane Fennel was a cousin to them all, her father, the Rev. 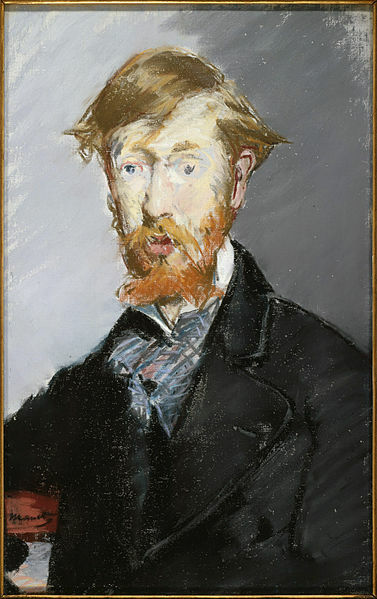 J. Fennell, having married a Miss Branwell of a former generation. It is clear from Charlotte’s account above that Patrick and Maria had a very loving, if all too brief, marriage, and their wedding day must have been an exciting and joyous one. 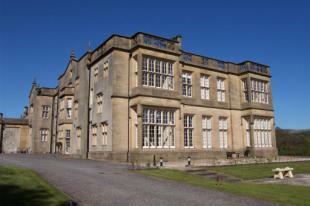 It is said that after the marriage in Guiseley, the two happy couples repaired to Woodhouse Grove school for their reception, cakes and all! Let us leave them there, and indeed leave 2018 on a note of love and promise. This has been the year of Emily Brontë, and I hope it has brought you closer to her and to her wonderful family, I certainly feel that it has done so for me. I wish you a Happy New Year, and I’ll have a new post out on the 1st of January 2019. Tempus fugit! 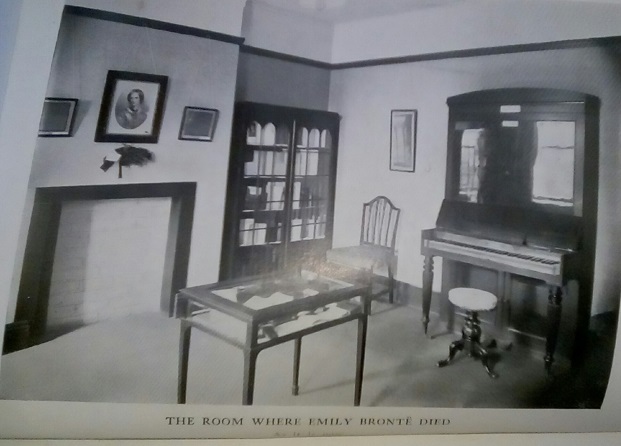 Charlotte was referring of course to the funeral of Emily Brontë, who was buried in the Brontë family vault in Haworth’s St. Michael and All Angels’ Church on 22nd December 1848 having died three days earlier. She joined her mother, her Aunt Elizabeth, her sisters Maria and Elizabeth and her brother Branwell in the vault, but there were two more spaces yet to be filled. After the church was rebuilt by Reverend Brontë’s successor, John Wade, a pillar was placed above the Brontë vault, a strange echo of the pillar that Branwell had placed between his sisters in his youthful painting of them. So, Christmas 1848 was a time of mourning. Charlotte had lost the sister she hero worshipped, Anne had lost her twin like sister and herself was now gravely ill, Patrick had lost the daughter he had called his right hand and the apple of his eye, and Keeper had lost the human who was the whole world to him. Emily herself was not scared of death, and she wrote about it in many of her brilliant poems, perhaps recalling John Keats who wrote, ‘Darkling I listen; and, for many a time, I have been half in love with easeful Death, Call’d him soft names in many a mused rhyme.’ Nevertheless, Emily was not an invariably gloomy woman, for we have reports of her happy, cheerful voice and her love of practical jokes. No, to Emily death was simply a fact of life the same as any other. It is perhaps fitting that Emily died and was buried around the time of the winter solstice. A time when death inevitably comes, when we reach the darkest point of the year, but that, as Emily knew, also heralds the beginning of a new light that will eventually bring new life, and the verdant beauty will return. Emily died, but the legend and legacy of Emily was just being born. 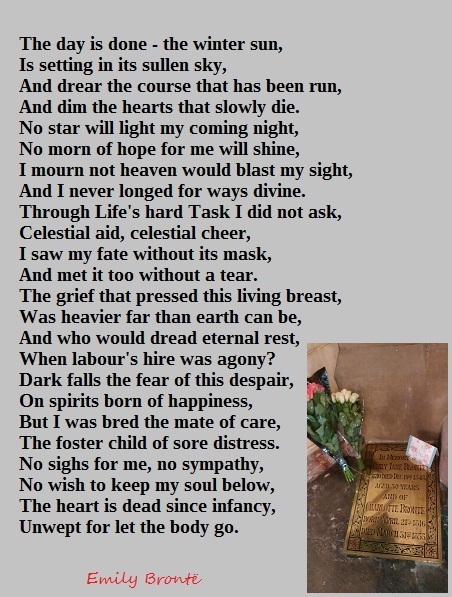 I will leave you with ‘At Castle Wood’, a remarkable poem by Emily Brontë in which she looks ahead to her death and funeral. But this is the time of Yule, from the old Norse word for wheel; the wheel of the year and life turns and joy will come again, so on Christmas day I will have a much happier post for you all. We are moving towards the end of a very special year for Emily Brontë, and for Brontë fans across the globe, because 2018 has marked the 200th anniversary of her birth, it has been in effect The Year of Emily. 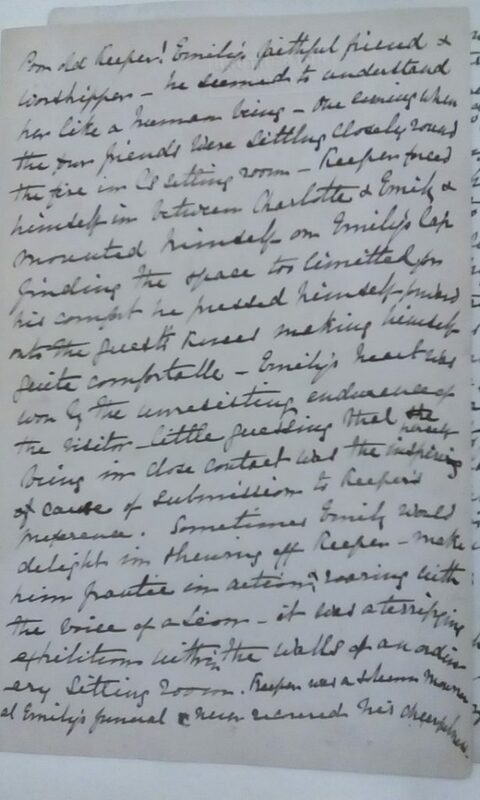 A birthday party was held in Haworth on the 30th of July; I could not be there but I was instead at another birthday party given for Emily – over 400 miles away in Penzance, the home of Emily’s mother and her maternal relatives, the Branwells. I loved every minute of my visit to Penzance and Cornwall this summer, and despite the distance from Haworth I felt close to the woman I had loved since I first opened ‘Wuthering Heights’ as an 18 year old student. Unfortunately, last minute circumstances have delayed my journey to Haworth until another day, but before Christmas I will have paused in silence by the couch on which Emily died, and have laid flowers by the pillar that marks the spot on the church pavement beneath which Emily’s mortal remains were laid. It is a mournful day for me, but not for Emily – she will always live on. Today I’m going to relate a story that’s now very little known, indeed that had been lost within the tiny print amidst a mass of yellow tinged nineteenth century newspapers. It’s a tale full of charity and care for those less fortunate than yourself, so it’s perfect for this Christmas season. If you’re sitting comfortably I’ll begin the tale of Charlotte Brontë and the boots. I can never stay away from the Brontë family for too long, so I may have news of two new Brontë related books next year – and that means my favourite thing of all, research! Some people might feel there’s nothing new to discover, but in fact you can sometimes find a new piece of documentary evidence that hits you right between the eyes, and illuminates further a character we know and love. That’s what happened to me yesterday as I read through some nineteenth century newspapers, and we find a story of Charlotte Brontë that is forgotten today, but which shows her studious side, her charitable side and her sense of fun. 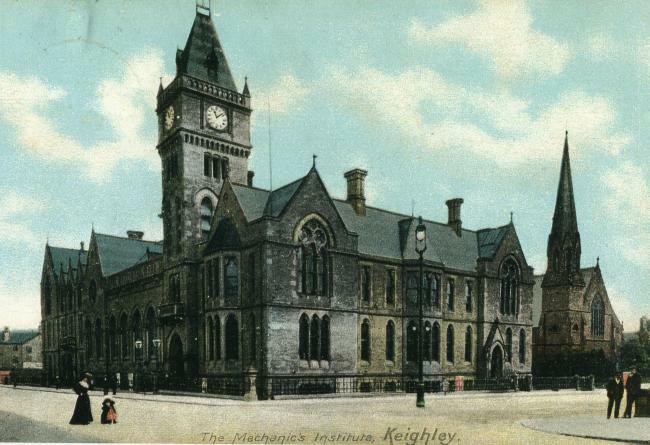 “About the month of April, 1851 (I think), I found myself one evening at Keighley, without money or friends. The factory I worked at had broken down, and, like most lads, I wandered purposelessly about to kill time. After wandering about the town till nine o’clock at night, the question where should I sleep forced itself upon my attention. Now, I had had at the Mechanics’ Institute of a neighbouring town instruction and practice in reciting pieces, and, spurred by hunger and the night air, I resolved to turn my abilities in that way into account by going into the various public-houses and offering to recite to the companies I found there, and then going round with the hat (cap in this case). The first house I went into I got sixpence for once reciting, with an offer that if I would stand on my head and sing a song they would double it. I pocketed the copper and the insult and decamped. Yet, fearing I had not enough to pay for a bed, I plucked up courage and tried in another hotel with more success, for one or two of the company assured me that if I waited upon Mr. Sam Wild, whose company was then in the town, I should be able do better than pitching in pubs. 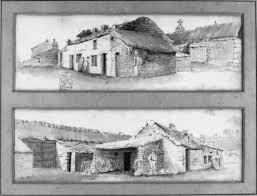 I then sought out lodgings in a common lodging-house. Being well-dressed – that is for such lodgings – the inmates treated me very respectfully; and one, a travelling glazier, paid for my supper. In doing this he asked me what I was doing there. I told him, and also the advice I had been given about applying to Wild, and then went to bed. In the morning I found a sad mishap had befallen me – some one had gone off with my boots. I told the landlady, but she said she could not help me, so in my perplexity I consulted the glazier, who, after listening to me went out and bought me a pair of ‘pushers’ – that is, boot fronts with the leg and back cut off. To interview the theatrical manager with these on was out of the question, and on naming my difficulty to the glazier he said, after a little consideration, that he would put me into the way of getting a pair of boots. He said he was going to ‘work’ Haworth that day, and if I would carry his glass crate he would see me all right. We trudged up the famous village, and then he pointed out a house where there was a lady – ‘Miss Charlotte’ he called her – who was ‘good for a pair of boots’ if I told her all my story. He then left me to ‘call’ the village. I felt my painful position very keenly. I durst not meet the glazier again without having seen ‘ Charlotte’ and eventually I mustered courage to knock at the door and ask for the lady. By and by a lady came, accompanied by another, younger than herself. With some difficulty I managed to tell my tale as I stood at the door, and was then invited into the kitchen and a pot of coffee and some bread and butter were put before me. By the time I had finished my breakfast the lady had returned to the kitchen and put some old boots before me, bidding me to try to fit a pair on. I did so, and found a pair which fitted pretty well. By this time the younger lady also returned into the kitchen. Both sat down, and Miss Charlotte then said, ‘I have given you breakfast, found you boots, and I am now going to talk to you a bit.’ She did talk to me, and in a way that made me wish I had never gone. She said that in nine cases out of ten people adopted my course of life from sheer idleness or gipsy instinct, and not because they had any special talent for theatricals. Did I think I had any talent? I told her I thought I had. Would I give her a specimen? Here was a dilemma! How could I refuse after the kindness with which I had been treated? In great pain, I said I would try to comply with her request. I gave, first, ‘Young Lochinvar,’ in my best style, and then her look of motherly severity seemed to relax a little. She then began to ask a number of questions about my family and other matters, which I answered as well as I could. Amongst other things. I told her I had relations at Cleckheaton, and described it and the neighbourhood to her. The younger lady then asked me if I knew any more recitations, and I replied I could give one or two from Shakespeare. Feeling more at ease, I at once recited one or two selections from ‘Hamlet’, without any remark being made. Miss Charlotte then asked me if I would give the dialogue between Hamlet and his mother, where the Queen says, “Do not for ever with thy veiled lids seek for thy noble father in the dust; thou know’st ’tis common, all that live must die—passing through nature to eternity.’ I complied as well I could; gave the whole scene without the ladies displaying any special interest in it, until I came to the line where Hamlet says, “I have that within which passeth show; these, but the trappings and the suits of woe,” when they both burst out into good-humoured laughter. I dared not ask the cause of this, but I suppose my looks showed my anxiety, and Charlotte said, ‘I’ve seen Hamlet played at Bradford, and they made the same mistake you have made in the word ‘suite.’ Shakespeare never could have used it in that sense – namely, a dress – but in a wider sense, ‘suite,’ pronounced ‘sweet,’ meaning that the King, Queen, and all about them were only acting the part of mourners, making their conduct match or harmonise with their supposed recent bereavement – the death of Hamlet’s father.’ I did not venture on any opinion, but said I believed it was in the book. Miss Charlotte said it was, but only showed the ignorant, shortsightedness of those who tampered with Shakespeare’s works. Other criticisms followed in a similar strain, but I have a very vague recollection of them. After advising me to return to work and leave playing to idlers, they showed me to the door, and bid me good-morning. I should state here, to account for what follows, that the persons in the second public-house in which had I the night before been reciting were members of Mr. Wild’s company, and that they assured me that I should get an engagement with them: so that when the string of questions which Miss Charlotte put after I preferred my request for the boots began to tighten, I said I had got the engagement, and only required the boots to enable me to enter upon it at once. On leaving the house I sought my friend the glazier, and found him repairing windows just in the hollow of the village. He advised me to return to Keighley at once, and see the manager. I did so, but he had as many as the business would allow of just then. In another week, however, when they commenced the tour of the fairs, he could give me a situation for building and parade business. Unasked, he kindly gave me half a crown, and said I could go behind at night if I wished. What a beautiful story, an encounter from two centuries ago that we can now see clearly again! 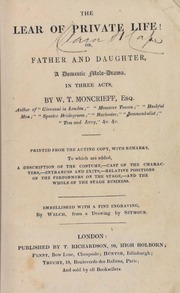 It’s an interesting social document as well; we see a tale of men losing their jobs and having nowhere to sleep and no money to buy food with, but isn’t it fascinating that even a man of such a fate can still recite a whole host of passages of Shakespeare from memory, and that people would pay to hear them? Two further questions jump out at me – just whose were the old boots fit for a young working man to wear? I can only think that Charlotte must have kept some of the boots and other belongings of her brother Branwell who had died three years previously. And then, who was the ‘younger woman’ who sat alongside Charlotte and later visited the travelling show with her? Martha Brown the servant lived in the parsonage at this time and was considerably younger, but it seems hardly likely that she would sit in on the interview as well, ask questions about Shakespeare and then laugh at the man’s interpretation of a particular word. No, it seems to me that this can only have been Charlotte’s great friend Ellen Nussey who often visited the parsonage. Ellen was almost exactly a year younger than Charlotte and would have been 34 at the time of this incident, but from Frank Peel’s account it seems that she looked visibly younger than her. Above all, we see that Charlotte was at heart a very kind and charitable woman, so much so that her reputation for it had spread outside of Haworth and into Keighley and beyond – otherwise, why would the Keighley glazier have known to send Frank to her, and even to have known her name, when in need of help? As Christmas approaches we should think of how we can do more to help those in need at this time of year, whether it be a lonely relative or neighbour, or those who have to turn to food banks – let’s all be a bit more loving, let’s all be a bit more Charlotte! On this day, 16th December 2018, we say a very happy birthday to a great woman writer, but on this occasion she lived not in Haworth but in Hampshire, and not in Bradford but in Bath. 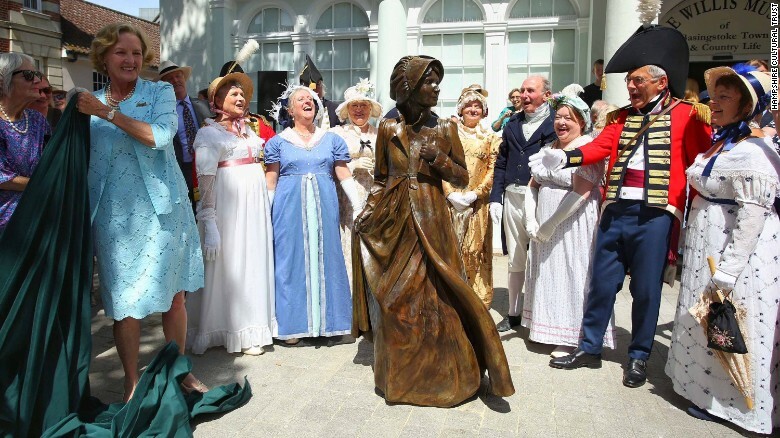 Yes, today we we mark the 243rd anniversary of the birth of Jane Austen. 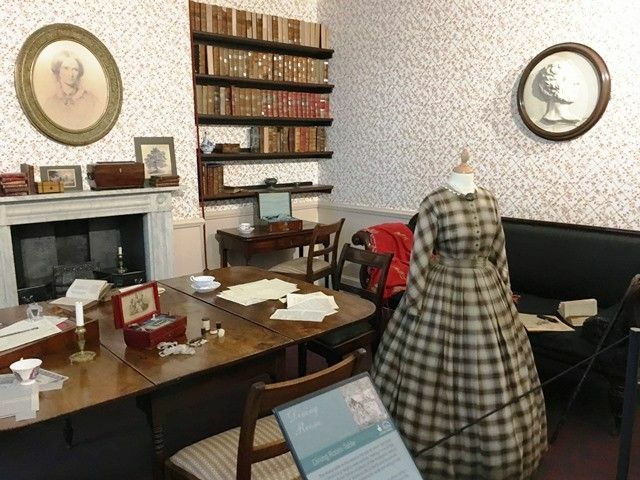 As you know, this blog is normally a Brontë rich zone, but Jane Austen is often linked with the Brontës due simply to her being a woman writer of incredible brilliance, so that in the minds of some members of the public it seeks that Jane and Charlotte become confused and the brilliant volunteers at the Brontë Parsonage Museum have to get used to being asked if it was the house that ‘Pride and Prejudice’ was written in. Today we’re going to look at Charlotte Brontë’s changing opinion of Jane Austen. Jane, again erroneously, is often thought of, like the Brontës, as an early Victorian writer, but in fact she belongs to the generation before that and was very much a Georgian. 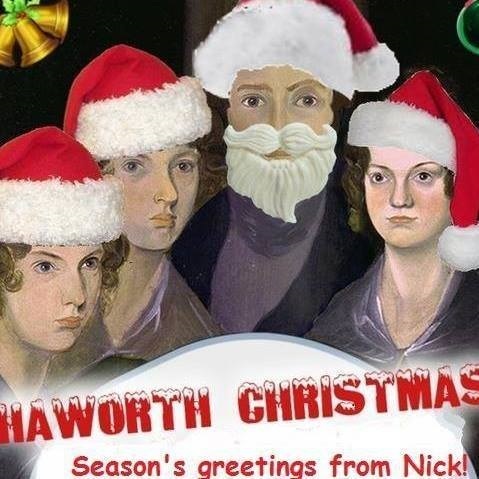 Her birth year of 1775 was just a year before that of Elizabeth Branwell, who became known as Aunt Branwell after removing from Penzance to Haworth in 1821 to care for her sister Maria and, later, her children. 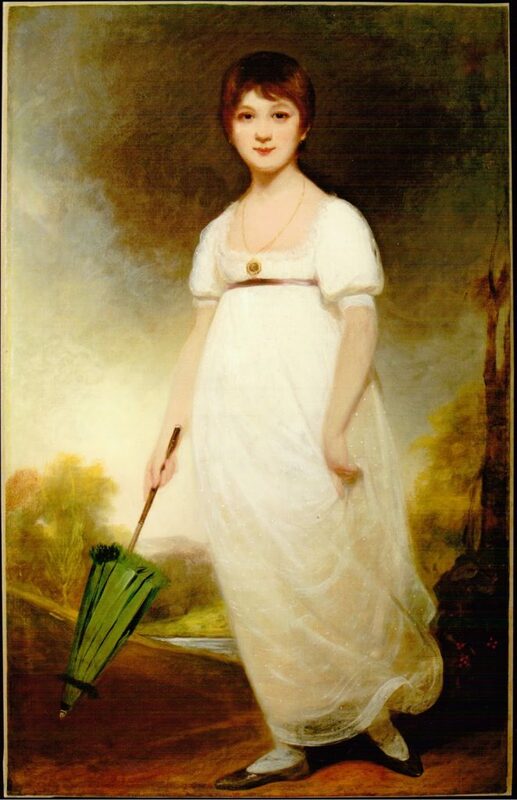 The world of balls and romantic intrigue so often portrayed by Austen must have been well known to Elizabeth Branwell in her younger years. 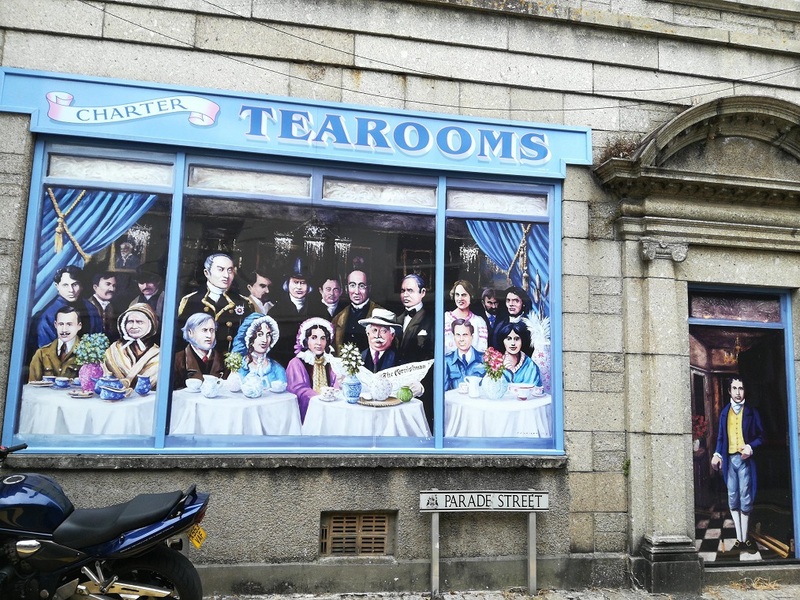 Penzance, like Bath, had its own Assembly Rooms that held society dances, and as the Branwells were among the leading families of the town it is likely that their daughters would often have been in attendance, so that we can imagine the Branwell sisters being somewhat akin to the Bennett girls. This is perhaps not so much a criticism of Austen, however, as a staunch defence by Charlotte of the writer she loved more than any other, Sir Walter Scott, author of the Waverley novels. Lewes, by the way, was the lover of Mary Anne Evans, better known as George Eliot. When Charlotte later met him she reported that she was moved to tears because he looked so much like her by then departed sister Emily. We see then that Charlotte Brontë praises Jane Austen for her writing ability, and her power to portray the wealthier classes, but still feels that she lacks passion. If she had known the sad story of Jane’s romances and losses she may have felt differently. In my opinion, Jane Austen was undoubtedly a genius of the first rank. Her books move along with a lightning pace, each page a joy to turn, and yet they are also full of humour and satire. 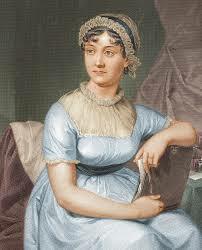 We can and should enjoy the Misses Brontë and Miss Austen, so let’s join together to say ‘Happy Birthday, Jane Austen’! Sometimes a name can be of vital importance – especially when it has been chosen by an individual rather than given to them. 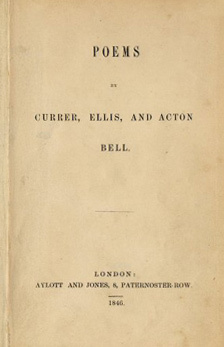 When the Bell brothers published their book of poetry ‘Poems by Currer, Ellis and Acton Bell‘ in 1846 it seemed to be an act of little significance, reportedly selling just two copies (although one of this duo of readers was so impressed that he wrote to the publisher, Aylott & Jones, for the Bell’s autographs). Of course, we know now this was an act of incredible significance as it was actually the first book to reach print by the Brontë sisters (and, on a side note, every copy was eventually sold). The poetry is important of course, but the names are very important and significant too – so let’s look at why the names of Currer, Ellis and Acton Bell were chosen – for behind the names lie very touching tales of the sisters and what they cherished the most. There is another, touching, reason why Charlotte may have prized Miss Currer so highly – she was renowned for her philanthropy, and especially for supporting members of the clergy in need. 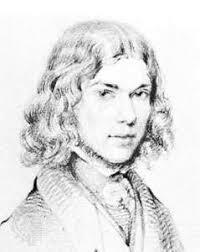 After Maria Brontë’s death in 1821 her husband Patrick was left distraught and almost destitute. He was rescued from the real possibility of penury by a very generous donation of £50 given to him by ‘a benevolent individual, a wealthy lady’. It seems that this lady who came to the rescue of the Brontë family was none other than Frances Mary Richardson Currer – and if Charlotte was later told this, she certainly never forgot it. 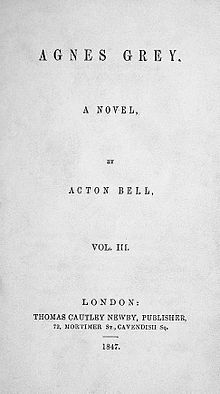 December 1847 saw the release of the debut novels of Acton Bell and Ellis Bell, published alongside each other in three volumes. 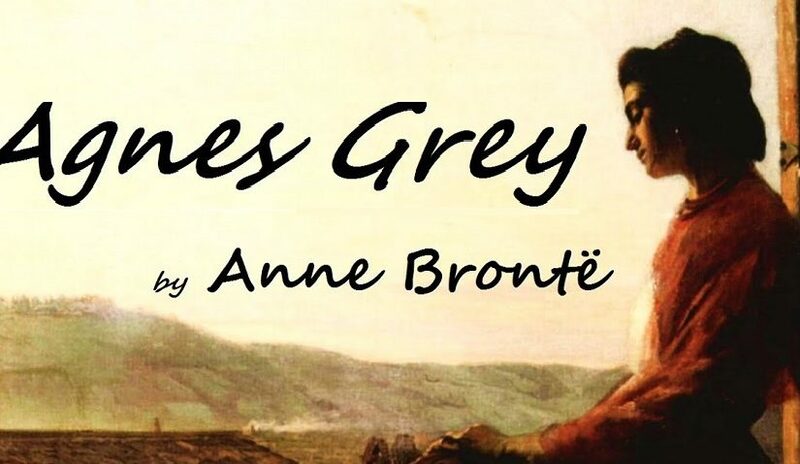 We know them better as Anne Brontë and Emily Brontë, of course, and the novels were ‘Agnes Grey’ and ‘Wuthering Heights’. 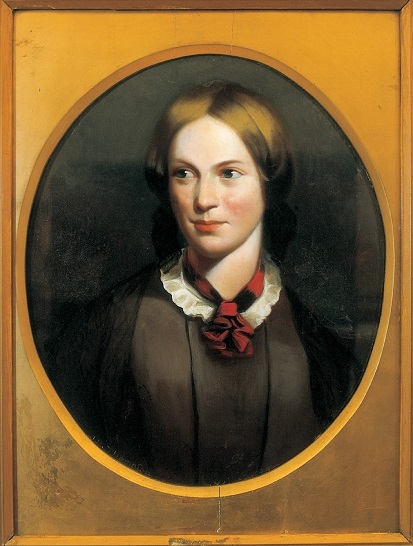 This was an exciting period for Charlotte too, as her ‘Jane Eyre’, despite being written long after her sisters’ novels, had already been released two months earlier, and the siblings must, like all new authors, have been waiting excitedly for the reviews to roll in. Unfortunately, many of the opinions passed on the Brontës, or the Bells as they were known then, were highly unperceptive, and say more about the reviewers and the restrictive, often puritanical, nature of mid nineteenth century society than they do about the books. Anne must have been frustrated by the insinuations that she had in effect copied, or at least taken inspiration from, Currer’s tale of a governess ‘Jane Eyre’. They’re very different books, except for the occupation of their protagonist, and of course if there was any inspiration it must have been Charlotte who took it from Anne’s book which she had already read when she commenced work on hers. 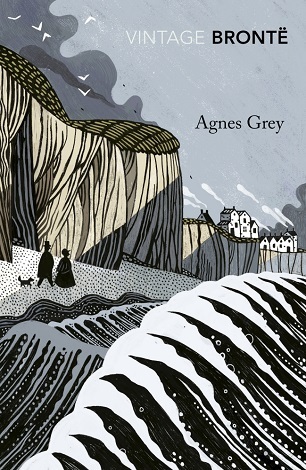 Whilst there are superficial similarities between the novels of Anne and Charlotte Brontë, it seems more difficult to see a resemblance between ‘Agnes Grey’ and ‘Wuthering Heights’, except in their brilliance. 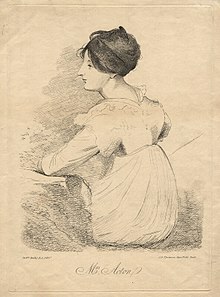 Anne never lived to see the huge advance in the reputation of her books, and their author, that came later in the nineteenth century and on to today, but she would surely have been quietly satisfied that people now recognised and valued the truth of her words, and her powerful, moving way of expressing them. Moore’s opinion is certainly worth taking notice of, after all he was an excellent novelist himself, and, unlike the Atlas reviewer, at least he knew how to spell the name Jane Austen! If you’re thinking of writing a book review, on Amazon or elsewhere, please do remember that it will be there forever, and that somewhere there’s a flesh and blood author waiting to hear the verdict on the child born from their imagination; after all, a review is for life, not just for Christmas.